Sweet Churros are one of those very popular street foods or street desserts in Turkey. They are mostly called Halka Tatlisi in Turkish, which could be translated as Circular Dessert because of its shape. I was so surprised when I learnt that Spanish and French cuisines have a kind of snack, very similar to Turkish circular dessert in shape. I have never eaten churros, but I know that it’s a popular snack, which is sometimes eaten even at breakfast. So I guess original churros are not as sweet as their Turkish version. When I realize how popular churros are around the world, I decided to name our halka tatlisi Sweet Churros to give you an idea about it. It is a cheap street dessert in Turkey and you just buy and eat it when walking on the Street. Vendors don’t use napkins, and noone asks for it. You just hold these sweet churros with a piece of paper, simiar to the one in these pictures. 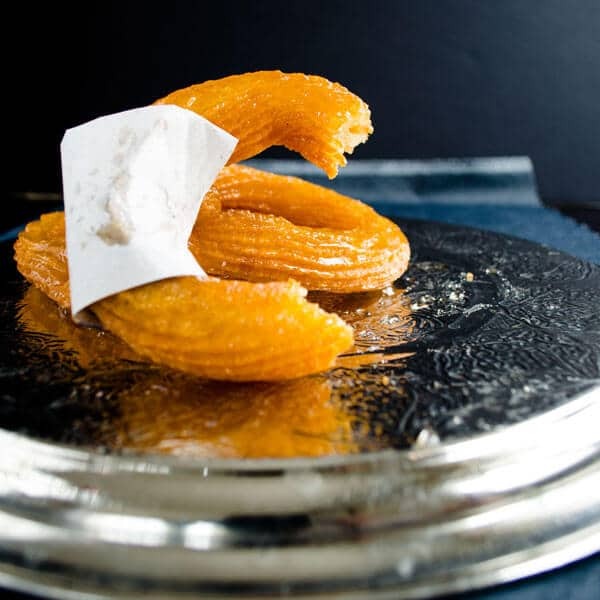 Although this dessert is so much loved by many people, Turkish sweet churros have a bad reputation about its name. Besides the name circular dessert, it has another interesting name. Well, I’m not sure if it’s a good idea to share it here; I don’t really want you to have a prejudice on this simple but scrumptious dessert. On the other hand, I’m trying to give you a good perspective of Turkish food and culture on this blog, so there would be something missing if I didn’t tell you the other name of these sweet churros in Turkish. Ok, these are also known as brothel dessert. It’s said that vendors sell these so sweet churros in front of brothels. That’s why it may not be a good idea to take this dessert to a dinner part you are invited if you are not very close to the host. As for the preparation of these sweet churros, a kind of cooked dough is first shaped in circles, then fried until crunchy and dipped into a cold sweet syrup. Its dough and cooking the method is the same with Turkish Tulumba Tatlisi. I don’t prefer making it at home, but I will share the recipe I got from a Turkish cookbook. Turkish sweet churros are fried and dipped into syrup. A crunchy and sweet street food! Start with its syrup. Mix sugar and water and heat it until it boils. Add in lemon juice when it gets a little thicker. Boil for a few minutes and let it cold. To prepare its dough, put water and butter in a pot and let it boil. Add in flour and stir fast. Add sugar and salt and stir over lowest heat until you get a non stick dough, for about 5 minutes. Take it from stove and let it cold stirring occasionally. Break eggs into it one by one when it reaches at room temperature. Add in semolina and starch and mix with a spatula or mixer until smooth. Pour this dough into a piping bag and squeeze in a circular shape. Put these circular desserts into cold oil and then bring the heat to medium. Fry them until crunchy and golden. Toss them in cold syrup when they are still hot and wait in syrup for a few minutes so that they can absorb it. Then take them out and serve. Note: For each frying, let the oil cold and then put other raw desserts into oil. It’s very important to put them in cold oil first. Otherwise they won’t be cooked well inside. FUNNY BC CHURROS ARE Hispanic! Stop stealing food and sweets from other countries, especially from Greece, and claiming them as your own! I didn’t know there was a Turkish version of churros! What a fun snack. And, good to know the alternate name for them! Merhaba Zerrin, amazing photos as always : ) these treats looks amazing ! they are so delicious and rich, really a treat, eline saglik!